So have you ever been to the zoo or an amusement part, or any really busy and crowded place, and there's some bonehead pushing one of those double-wide strollers around? I had two kids under the age of two at one point so I get it -- having multiple young children is hard. But never, ever, have I chosen to push a stroller, even a single one, in an environment like that. I mean, who do you think you are, taking up 5 times more space than anyone else? For real. Now, nearly every rink I've been too has narrow entry doors. Most also have really undersized locker rooms and, often, have a high traffic hallway to the locker rooms where teams are coming just as other teams are going. It's a cramped environment, plain and simple, worse than a gift shop at Disney World. 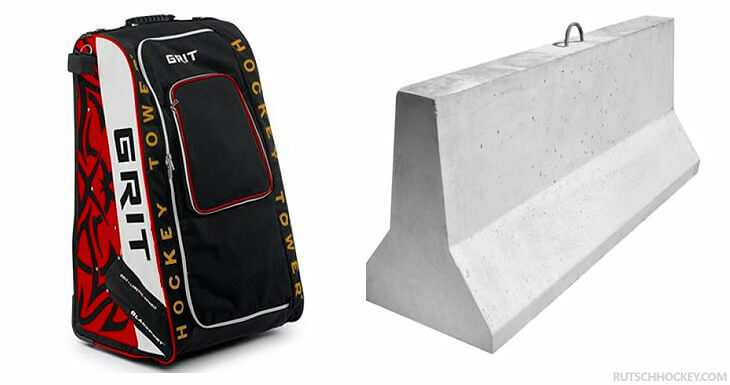 If you're a parent of a kid rolling one of those unweildy (and expensive) Grit Tower hockey bags and getting stuck in doorways, well, you're not helping the situation at all. I mean, imagine if every kid on your team had one of those? You can't tuck them under the bench in the locker room and they don't fit inside locker stalls, if your locker room is fortunate enough to have them. Needlessly huge...even when they're empty. It's like putting up jersey barriers all over the place -- really, they look an awful lot like jersey barriers, don't they? Look at the picture! One thing a confined space does NOT neet is an additional barrier. If there's one thing we don't need in the locker room, it's unnecessary obstacles. The room is crowded enough as it is -- especially with the younger kids where parents are in the room too. See below, plenty of room, and not a wheeled bag in sight! Not a coincidence. If you've chosen one of these bags for your children, think again when it comes time to to replace it. You'll be doing everyone that frequents a hockey rink a favor. 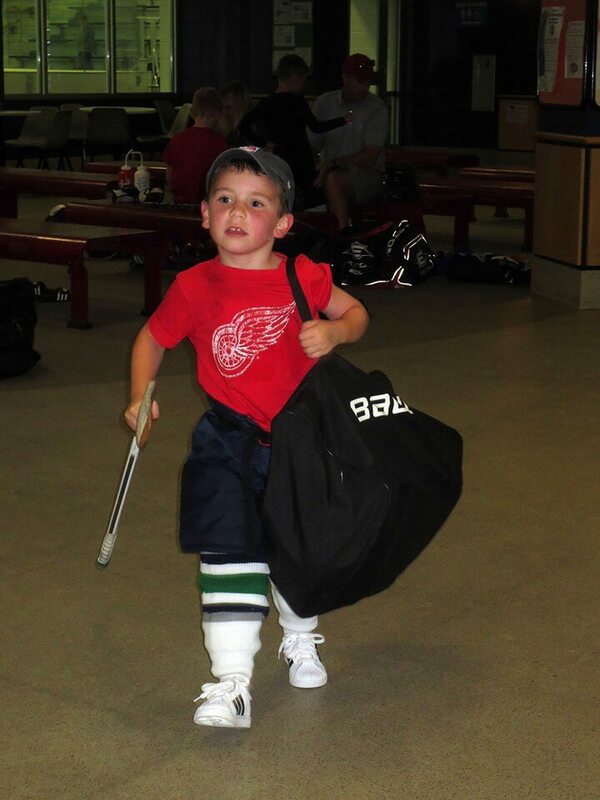 Taking it a step further...when you buy your child a more traditional hockey bag, without wheels, make them carry it. 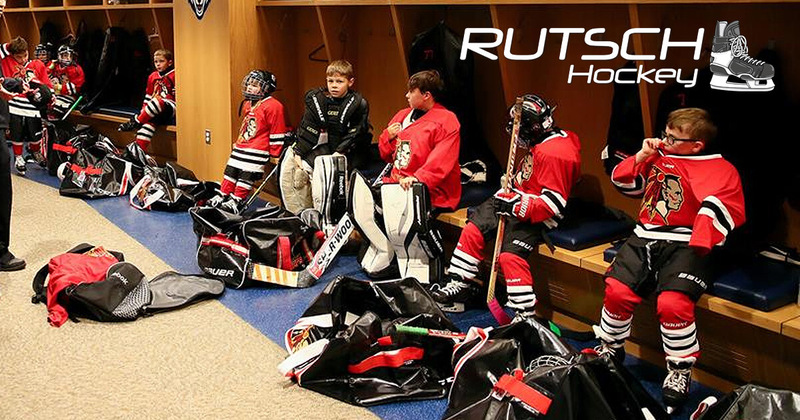 Hockey parents do a lot for their children...but let's not take it too far. You might be their chauffeur...but you're not their mule. Don't be an enabler. They want to play hockey? Then they need to pull some of the weight too. They might complain at first, and you might think, "Oh, they can't carry that big bag..." but you're wrong. If the bag contains only what they'll be wearing on the ice...they most certainly can carry it. If they can wear it, they can carry it. That's my son Duncan at four years old...carrying his bag. 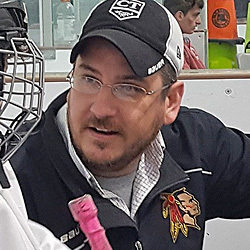 Stop carrying your 12 year old's equipment. And don't let them "wheel" it in either. Wheeled bags are for the lazy. Those Grit Tower bads are for the lazy *and* inconsiderate.